Battles over newspaper coverage of the Mormon church date back to the earliest years of the most persecuted and persistent cult in American religious history. Today, The Church of Jesus Christ of Latter-day Saints is a largely respected world religion that claims more than 15 million members. But that was not the church’s reputation in the summer of 1844, when dissident Mormons published an early expose of the polygamous practices of founder Joseph Smith in the one and only issue of an Illinois newspaper called The Nauvoo Expositor. Troops from Smith’s vigilante army trashed the newspaper, inspiring a reaction from the dissident forces and anti-Mormon zealots that ended with the imprisonment and murder of the first Mormon prophet. 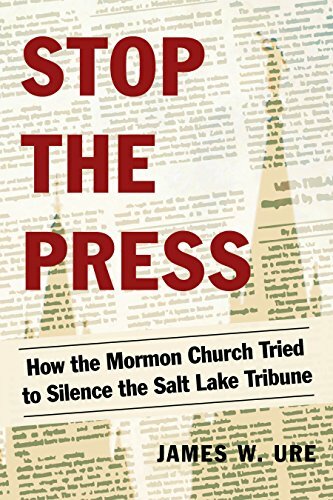 In Stop the Press: How the Mormon Church Tried to Silence the Salt Lake Tribune, author James W. Ure provides a fascinating study of how newspaper coverage of the church’s checkered past continues to spark press battles in the ever-shrinking American newspaper business. At the center of this story is the decades-long dance between the church-owned Deseret News and The Salt Lake Tribune, which was founded in 1870 by a group of businessmen who left the Mormon fold. The paper was later owned for many years by a wealthy Roman Catholic family that kept its independent editorial voice alive. For nearly a century and a half, the Tribune has provided a much-needed counterpoint to the theocratic state of affairs in Utah, where the Mormon church continues to wield enormous political, cultural, and economic power. Over the decades, the Tribune’s coverage of the Mormon church has shifted from stridently harsh to respectfully fair, but the story that won’t go away—the infamous Mountain Meadows Massacre in southern Utah in September 1857—has always been a thorn in the side of the Latter-day Saints. Some 120 innocent men, women and children on a wagon train headed to California from Arkansas were slaughtered by a Mormon militia that sought to blame the massacre on Native Americans. The crime came amid rising war hysteria about a possible U.S. invasion of the Utah territory and Mormon teachings about “blood atonement” to avenge the murders of Smith and other early church authorities. In 1999, the reconstruction of a monument on the site led to the excavation of some of the settlers’ remains, prompting a reexamination of the massacre and a series of articles in the Tribune that re-opened questions as to whether the early church prophet Brigham Young indirectly inspired or directly ordered the attack. Ure argues that the Tribune series provoked Mormon church leaders to devise a secret plan to financially cripple the newspaper by manipulating the terms of a joint operating agreement between the church-owned Deseret News and the independent Salt Lake Tribune. This alleged plot involved conspiring to encourage two newspaper vulture capitalists to buy the Tribune, slash its budget, sell off its assets, and then shut it down. These complicated and somewhat confusing corporate machinations involved numerous players and are not always easy to follow in this account. In the end, in 2016, a Utah businessman with more respectable intentions wound up buying the Tribune and, at least for now, keeping it afloat. While Ure presents a fairly solid case, this reader comes away wondering how much of the Tribune’s troubles should be blamed on the Mormon church, and how much on the downsizing of the entire American newspaper business. One can put at least equal blame on the decision by its previous owners—a wealthy Catholic family—to get out of the newspaper business while the getting out was good. Don Lattin worked for nearly thirty years at two San Francisco newspapers that competed and conspired with each other for more than a century, and twenty years ago wrote a series of articles on the Mormon church that took him around the world.